Purchase of blue flowers for bouquets at a bargain price in the online shop KROKUS. ❶ Blue flowers for bouquets at a bargain price in the online shop KROKUS. Blue flowers for bouquets at a bargain price in the online shop KROKUS. Would you like to order blue flowers for bouquets with delivery to Riga or to another city in Latvia? Then the best solution will be to contact the online shop KROKUS. One of the most remarkable and original solutions in floristry are blue flowers for bouquets. Bright and rich shade of compositions, contrasting against the background of light packaging, decorative accessories or interior items, attracts attention and pleases the eye. Blue bouquets are often used as gifts for men. In addition, blue flowers for wedding bouquets are used to create unique wedding bouquets for a celebration in Riga (Latvia). Prompt flower delivery in riga at the best price is available for order on the website of the online shop KROKUS. The online shop KROKUS is pleased to welcome visitors of its official website and offer its customers a wide range of the most beautiful flower arrangements from Riga and all over Latvia, including blue flowers for bouquets with delivery to any address of the capital and other cities. In the catalog of goods of our studio, dark blue flowers for wedding bouquets, thanks to which you can effectively complement the image of the bride, are available for customers. Among them there are traditional irises, as well as absolutely original blue roses. Ordering a composition of these flowers, you get a stunning bouquet that will become the center of attention of every guest and will serve as a delightful accessory for the wedding photo shoot. To small blue flowers for bouquets delivered by KROKUS in Riga and all over Latvia, it is necessary to refer delphiniums and lavender. Meadow flowers are wonderful helpers when creating author's bouquets. Also they can be the basis for the production of everyday mini-compositions that are distinguished by an affordable price. Among other blue flowers for wedding bouquets it is also worth mentioning lisianthus, anemones, orchids. The compositions from them look showy and can be used not only as an addition to the bride's dress, but also as a wedding gift to the newlyweds. A hydrangea is considered a practical and universal blue filler flowers for bouquets in Riga (Latvia). Due to its lush shape and many small petals, it perfectly makes the composition volume, making it larger and larger. The best onlne flower shop in riga will make any holiday bright and memorable for you! 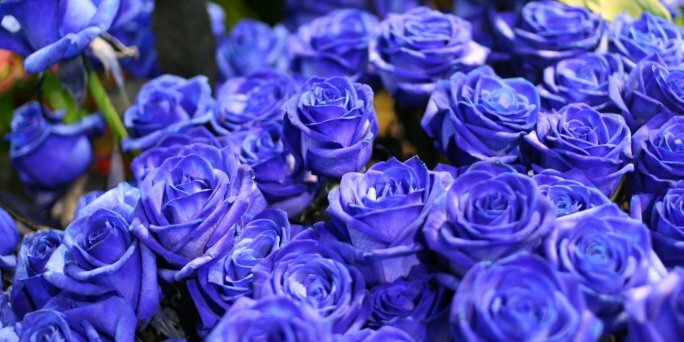 You can order any of the types of blue flowers for bouquets with delivery in Riga and all over Latvia, using the services of the online shop KROKUS. To do this, make an order on our website or simply call the company manager at the specified number and specify all details of the order in telephone mode.